These classically trained African-American tenors hit the high C's in OPERA, belt out BROADWAY, deliver the GOSPEL, bend the BLUES, sass the JAZZ, stir your SOUL, and lift SPIRITUALS right off the ground. The tenors of THREE MO’ TENORS are men who have developed a musical repertoire with extraordinary breadth. Like Olympic decathlon athletes, these classically trained, multi-talented operatic tenors can do it all! They have mastered not only operatic music, but also jazz, gospel, soul, spirituals, New School, Broadway and the blues as well. THREE MO’ TENORS showcases the incredible versatility of African-American tenors. It starts with classical opera and goes on to feature seven more musical styles that span four hundred years of music -- all in one entertaining evening. THREE MO’ TENORS is about more than just three men. It is a story about the history and the future of exceptional Black tenors who deserve to be heard. Because of the extraordinary vocal demands of the show, THREE MO’ TENORS features two equally exceptional casts taking the stage, three at a time in alternating performances. THREE MO’ TENORS has already introduced eleven African-American tenors to enthusiastic audiences -- and as long as there are more undiscovered Black tenors waiting in the wings, THREE MO’ TENORS will be here to tell their amazing story. "Three Mo' Tenors can sing everything from classical to disco!" "The audience roared their approval!" "Critics Choice." "It's difficult to imagine most mainstream musical performers competing with the sheer effervescence and range of these men!" "A treat to the ear! . . . Amazing and inspiring! . . . An awesome trip through 400 years and a range of musical styles that includes opera, Broadway, jazz, blues, spirituals, soul, gospel and hip-hop! . . . Among the most versatile and talented black tenors in the business!" "Delightful and innovative! . . . There's an emotional thread that unites it all: Passion!" "A perfectly performed evening of popular and classical music! . . . The classical arias were only used as an appetizer . . . As the main course, the remainder of the show was delicious visually, spiritually and especially acoustically!" "The audience cheered and stomped in delight! . . . It's impossible not to like the show!" as a singer myself i recognize the wide versitility of the voices these men exhibit on this cd. After having seen the performance in New York, I bought multiple copies of the CD to send to my friends in Calif. When you decide to grace San Francisco, you'll already have a ready made captive audience. Wonderful. Only regret is not being able to watch them. A terrific album, giving a great taste of what the guys must be like on stage, in person. Only complaint was some unevenness in recording, but realize it was from live performances. I would have liked to hear them show off their operatic skills a little more, but I can't imagine any other opera singers doing Motown and not sounding riduculous. Enjoyed it immensely and will play it many more times. Absolutely wonderful! Saw these guys on the Today Show and knew I had to have this CD. Wish it had been a DVD. The song selections showed their range of talent and all three are so good. I loved this music!! Would love to have a studio CD, as well as this one of live music. I know the studio one would be better. All in all, I'm glad I got this one though. I loved this music. These guys should be heard by everyone who loves good music. The amount of talent that generates from this performance is simply undescribable. You simply must see them for yourself. Great music, great sound--wonderful listening music. These artists are awesome and have all the bases covered from opera to hip hop. Versatile describes the vocal range of the tenors and the breath of the music they have mastered. All that's left to do is to create a video of this show. 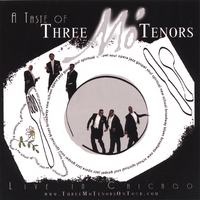 There is a DVD of Three Mo Tenors out, but it is the Original 3, these are a new version of the group. I had the good fortune to see the originals in Chicago in 2001?2? they were phenomonal, it had also been shown on PBS at one time.